Maintaining a low-carb diet can be quite difficult because you have to cut back on your favorite foods. If deserts have been the favorite part of your meals you must know the struggle of resisting the urge to eat your favorite desert. However, the good news is that you do not have to feel deprived if you are following a low-carb or keto diet. There are many low carb protein bars available in the market that cater to people who want to maintain their ideal weight. This article will review keto friendly bars so that you can carry on with your diet without having a cheat day. By adding low carb bars to your meals you will feel more satisfied and fulfilled. These portable meal substitutes are ideal for busy lifestyles, convenience and may actually help boost portion control. 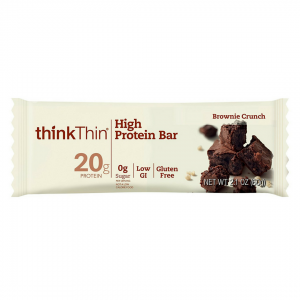 The thinkThin bars are meant to be used as meal replacements and snack products. Out list reviews the Chunky Peanut Butter Bar which consists of 0g of sugar with 20g of protein. This is a bar that will help you keep weight off while providing you with all day long energy. This product does not have any gluten and is low on the glycemic index making it very helpful when you are trying to lose weight. You can eat it on the go or use it as a substitute for breakfast, lunch or dinner. There are different flavors to choose from, 12 to be exact, with one to suit every dieter’s taste buds. The peanut butter option is ideal for people who enjoy the classic combination of peanut butter and chocolate. The pack comes with ten thinThink Protein Bars with a very affordable price tag. Each bar contains 24g of carbs which might be the only setback for some people. However, as a breakfast serving or pre-workout snack these can work wonders. 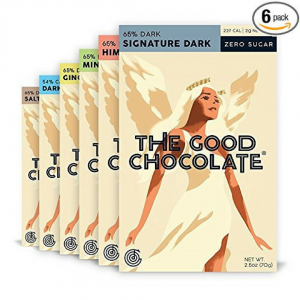 The Good Chocolate comes in an assorted pack of six low-carb bars in different flavors that would work well for people who want to try out something different after their meals. Nutritionally, each bar contains 2g net carbs which yields about 45% less calories than standard low calorie bars. Flavors to enjoy include ginger, mint, salt, almond, milk and dark chocolate. These low carb protein bars are vegan except for the milk flavoring and do not contain any soy. The company claims this to be the first bean-to-bar chocolate that is 100% organic and made exclusively with no added sugars. Customers who have tried this product verify that the bars leave a good after taste and do not cause a bloating sensation. Others report positive results regarding weight loss as these low calorie count bars do not contain any added sugars. This might be an expensive package for a pack of six bars but the quality makes it a feasible deal. However, it still might be too pricey for many people based on serving amount. 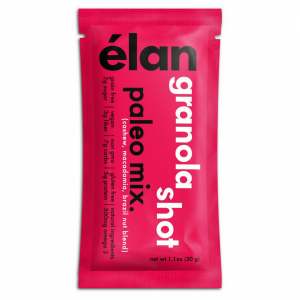 The ELAN Paleo Granola bar easily qualifies as one of the best keto protein bars available. Based on keto principles of including nuts and seeds in the diet, this bar is made from cashew nuts and seeds which give it a rich and luxurious texture. Besides that it only contains 2g of sugar and 4g of net carb with a high protein content that will also provide energy. Being a vegan friendly product, these bars are made from plant based ingredients only. Plus, they are also non-GMO, gluten-free and grain-free. The fact that nuts and coconut fats are part of the ingredients, makes this product fulfill required nutritional values. The ELAN bars are suitable to consume for breakfast, snack or even while you travel. Customers who have tried this product have commended its rich taste and unique blend. Being free of any artificial flavors or preservatives also makes these bars one of the most low-carb protein bars available. This may be considered an expensive product being a single bar, but since it contains seeds and nuts the price can be justified. If you want to try out keto friendly bars, then this should definitely be on your list. This product comes as a pack of 16 protein bars in eight delicious flavors loaded with nutrition. Each bar contains egg whites and dry nuts to offer the best blend to customers who are looking for delicious low carb options. Each bar also comes with 12 g of protein which will energize you in the morning, in between meals or after workouts. The dense protein content is enough to keep you working till your next meal if you take this bar in the morning instead of a heavy breakfast. The bars are also soy, gluten and dairy free to serve different consumers. Using egg whites instead of whey also makes this product suitable for lactose intolerant individuals. But perhaps the best thing about this product is the minimalist ingredient list that shows real food ingredients. The manufacturers promise a product that has a well-balanced nutritional profile and do not disappoint to deliver. The bars are also Kosher, Paleo and Whole 30 compliant. Since this is a pack of 16 protein bars, it makes up for the price. 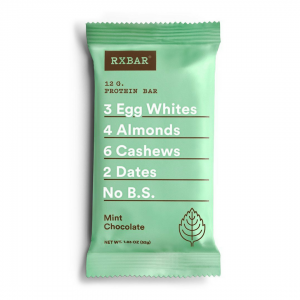 In a nutshell, RXBN Protein Bars have much to offer if you want to maintain weight without depriving your body of essential vitamins and nutrients that are needed for a healthy lifestyle. This product features a pack of eight protein bars and contains 2 each of four flavors: oatmeal, mint chocolate, peanut butter and chocolate. Every bar contains 9+ proteins and will easily satisfy your cravings as well. The same is also packed with multiple vitamins and minerals to provide you with nutrition. 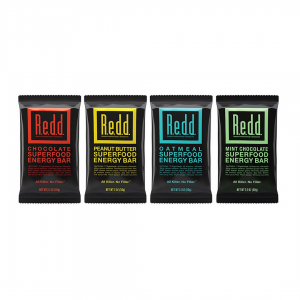 Dieting does not mean depriving yourself of essential nutrients therefore this Red Superfood Energy Bar pack is made with the nutritional value of average consumers in mind. This pack does not only offer variety but also ensures health. You can also use these bars as breakfast since they offer multiple options. There is also a coffee component in order to give your weight loss a boost while also helping you stay alert. For a pack of eight this is quite an affordable deal so you can order these easily. Red Bars are not only vegan and gluten free but they are also kosher. They are made to serve as many people as possible so that anyone following different dietary restrictions can consume them. 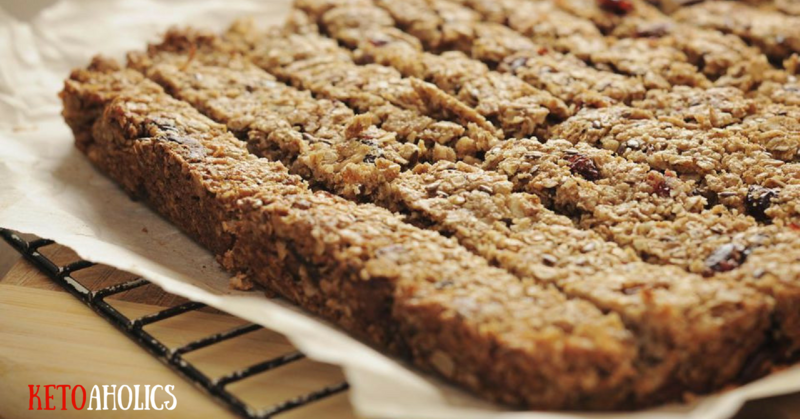 These bars have been said to have a wonderful blend of taste while also serving protein. They can serve as snacks and pre-workout energy bars as well. Overall, this is a decent package for anyone following a low carb diet. The caffeine is a nice addition as it will help you focus on your tasks without losing concentration even if you skip your morning cup of tea or coffee. Every dieting bible starts with the advice to cut back on carbs and eat smaller portions. 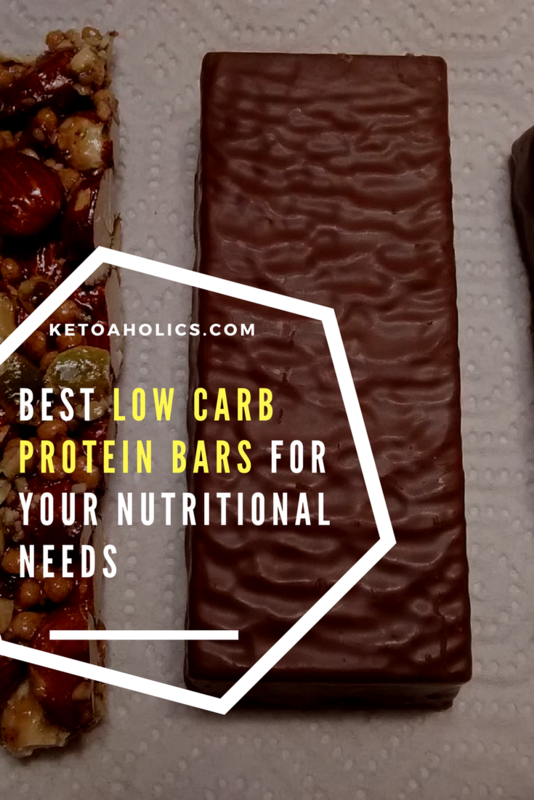 It may make you wonder why one should add protein bars in their keto diet when the goal is to lose weight. There are several reasons that you should munch on low-carb protein bars. When you dramatically cut back on your diet you are bound to deprive it of essential nutrients that balance your overall health. But by adding a protein bar to your diet you will be able to provide your body the vitamins and minerals that are needed for growth. Besides that many people can start a low carb diet but only a few stick to it. It is because the challenge to keep your hands off of snacks is a difficult one if you have been binge eating in past. However, a low carb keto bar will fulfill you so you don’t feel the need to overeat. This will help you stick to your weight loss plan. In essence, protein bars are a great way to provide your body nutrition without putting on any weight. Your choice of protein bars should be based on your body weight and how much nutritional value you need in a day. A great thing about keto bars is that they will suppress your appetite. You will automatically feel less need to eat or snack. This will in turn help you lose weight effectively without falling victim to your old habits. Each keto bar has different carb and calorie servings so it is important that you keep a close eye on what you are consuming. As you have options to choose from hundreds of flavors no one will feel left out. Whether you like a creamy texture or crunchy texture there are protein bars available to cater to your taste buds. It is important that you choose your protein bar smartly. Often times low carb protein bars promise differently when they advertise but in reality they have artificial flavorings, sugars and preservatives which are not as healthy as they claim to be. By comparing various keto bars you can learn which bar is the best for you. Of the five protein bars reviewed here, some have more carbs than others, but also come with added benefits of being vegan, kosher, gluten free and mineral fortified. The choice of bars is nutritionally dense so that your body is energized with important nutrients. Since different flavors are also available, it will also make up for deserts after meals. These bars cater to different consumers so that no one feels left out. Most of the given options here will also make up for healthy breakfast bars so that you can start your day on an energetic foot. Being low-carb they will suppress your diet by providing you protein for a long time. You will not feel hungry before your next meal either. These recommendations for low carb protein bars are made to help you curb your cravings by fulfilling the needs of your body. Some are more affordable than others so there is one to fit every budget type.